Its time to saddle up and take our party way out West! Here are all the Western Party Ideas to make your event a real sharpshooter! So whether its a cowboy birthday party or just an excuse to dress up as Cowboys and Indians pick up some great ideas and tips straight from the Wild West! Cowboy Wanted Posters are cool. Put the name of the desperado (your friend) in the poster. Or you could find a font on your computer that looks like cattle branding. Use words like I need a possee of mean moody cowboys for a big birthday round-up at my ranch. Try to come up with a Western Name for your house or venue (you can always put the real name in brackets on on the back of your invite. Search out any Cowboy and Indian bits and pieces you can muster. If you can get hold of them a bale or two of straw make great props. With a check tablecloth over them they also make great table later for the party food. Horseshoes are easily made from card covered in silver foil. Wanted posters on the wall are easy to make and so are signs pointing to places like Dodge City or The Lazy X Ranch. There are all sorts of downloads available on the internet if you are not strong on the creative side. Hessian sacking hung on the walls makes a good backdrop for these signs and posters. You can make cool cactus cut outs from cardboard and green paint. If you can get that corrugated cardboard they look even better. Decorate your party table with hessian sacking and check tableclothes. Upturned cowboy hats make good bowls for serving crisps and sweets. 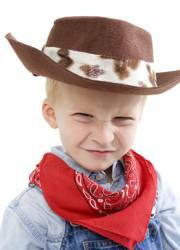 Cowboys are easy - check shirts, waistcoats, jeans, stetson hats and bandanas. You may like to add eyeliner moustaches and beards. Indians - You can make simple Indian tunics by cutting holes in the middle of a blanket or small sheet and adding a belt. Indian motifs beads and fringes add to the look. Don't forget a simple headband with one or more feathers. 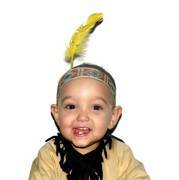 Indian War Paint turns even the shyest youngster into an Indian Brave! Cowboys may be a tough bunch but cowboy party games should also be lots of fun! The pictures should be about A4 size(30x21cms) and you need 2 sets of each design. You may like to laminate one set of these or stick them on to card. The six designs are placed on the walls around your party hall. Ok now its time for a Cowboy Hoe-down. Play your Country and Western Classics (Songs like Cotton Eyed Joe works well) and show your kids how to Dozee-Doe. Even big brave cowboys will enjoy doing silly dances to this, doing the linking arms thing etc, but expect to have to join in too! One card from the other pile is then chosen at random and all the kids who chose that picture ie all the broncos win a small sweet. Then everyone is back in the middle to do it all again.The great thing about this game is everyone is involved all the time and no-one is out. Some kids will win several times but if at the end there are any cowboys who have not been lucky make sure they get a sweet! Cowboy hats - one for every child at the party (many of the kids will bring one to the party anyway but you may like to have a few spares). The teams line up at one end of your venue. Collect up their hats and add your own extras if needed. At the other end sitting on the chairs are adult helpers. They have a hat on their head and the rest in their laps. The first cowboys in each team run up the course. They must run round the back of the chair and grab the cowboy hat from the adult and run back while putting it on. They then grab the hand of the second cowboy and both run back down the course together. Rounding the chair at the end number 2 cowboy takes the next hat from the adult's head and they both run back to pick up cowboy number 3. The race continues with small chains of cowboys running up and down until the whole team is wearing a hat whereupon they run back to the start line. The first team sitting down wearing hats wins. You can make the race a bit longer by having them take the hats back in the same way as well - dropping off a hat and a cowboy each time. Warning - As the chains of excited cowboys get longer make sure the leaders are making sure they are not running too fast for their team, especially around corners. This is a nice simple addition to your cowboy party. The cactus is made from hardboard. Muster your cowboys into 2 teams and see who can hook the most hoops on the cactus. Prepare in advance a rattlesnake by stuffing an old sock (needs to be reasonably long with newspaper or other stuffing. At the end include a small tin or other container with some dried beans, pasta or buttons that will rattle when shaken. Tie the end and stick some eyes on your rattlesnake. The kids sit in a circle and pass the rattler around to music. Whoever is holding the rattler when the music stops wins a small prize. Continue until everyone has won. You can use this as a way of giving out party bags at the end of your party. When making your snake put the rattle up in the head. Tie a knot behind the head then load in a few small sweets before adding another knot. Add another parcel of sweets and knot again. Continue like this until you have a section of snake for every guest. Play as normal but each time someone is left holding the rattler you cut a section of the snake up to the next knot. Best to get an adult to do the cutting with a big pair of scissors. 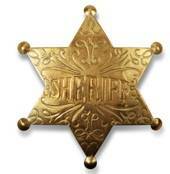 Take your cowboys away from the action and hide a silver sheriffs badge somewhere. The returning cowboys have to hunt for the Sheriff. First show the children the pictures and the actions they need to do for each. For the Cowboys they need to shout Yee Hahh! and fire their imaginary pistols. For the Indians they need to wave their imaginary tomahawks in the air and let out Indian war cries. For the Bucking Broncos they must buck and jump like wild horses. For the Buffaloes they put their fingers up like horns and snort and stomp. Pin the pictures on the four sides of the room. Play some country and Western music and get the children to have a bit of a hoe-down. Every so often you stop the music and shout either "Cowboys" or "Indians". The children then have to rush to the appropriate end of the room making the correct actions and noises.